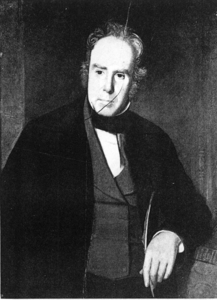 William Carleton was an Irish novelist. Carleton's father was a Roman Catholic tenant farmer, who supported fourteen children on as many acres, and young Carleton passed his early life among scenes similar to those he later described in his books. Aged about nineteen, he undertook one of the religious pilgrimages then common in Ireland. His experiences as a pilgrim, narrated in "The Lough Derg Pilgrim," made him give up the thought of entering the church, and he eventually became a Protestant. His vacillating ideas as to a mode of life were determined by reading the picaresque novel Gil Blas (by Alain-Ren� Lesage, 1668-1747). He decided to try what fortune had in store for him. He went to Killanny, County Louth. For six months he served as tutor to the family of a farmer named Piers Murphy. After some other experiments he set out for Dublin, arriving with two shillings and sixpence in his pocket. He obtained some teaching and a clerkship in a Sunday School office, began to contribute to journals, and "The Pilgrimage to Lough Derg," which was published in the Christian Examiner, attracted great attention. In 1830 appeared the first series of Traits and Stories of the Irish Peasantry (2 vols. ), which immediately placed Carleton in the first rank of Irish novelists. A second series (3 vols. ), containing, among other stories, "Tubber Derg, or the Red Well," appeared in 1833, and Tales of Ireland in 1834. From that time until within a few years of his death he wrote constantly. "Fardorougha the Miser, or the Convicts of Lisnamona" appeared in 1837-1838 in the Dublin University Magazine. Some of his later stories, "The Squanders of Castle Squander" (1852) for instance, are spoiled by the mass of political matter in them. In spite of his considerable literary production, Carleton remained poor, but his necessities were relieved in 1848 by a pension of �200 a year granted by Lord John Russell in response to a memorial on Carleton's behalf signed by numbers of distinguished persons in Ireland. He died at Sandford, County Dublin, and is interred at Mount Jerome Cemetery, Harold's Cross, Dublin.